Both Airbus and Boeing have now reported Q1-2019 operational performance. The most anticipated was that of Boeing, which continues to respond to the global grounding of the manufacturer’s 737 MAX family of aircraft after two tragic accidents. Boeing’s Q1 performance indeed reflected the initial impacts on one of its most profitable aircraft families. European based Airbus delivered a total of 162 aircraft in Q1, slightly higher than the volume level of Q2-2018. Upwards of 68 aircraft were delivered during the final month of March, once again indicating signs of supply network strain during the opening quarter. The declared 2019 milestone is to boost total single-aisle production to 60 aircraft per month from the stated existing level of 52 per month. The sooner this is consistently achieved, the better. Five separate global based production facilities will be dedicated to single-aisle production. Airbus reported a total of 62 net new orders for Q1 with the majority weighted in the March time period. The company did announce a significant A320 deal in the March with a consortium of China based airlines. At the end of Q1, backlog of commercial aircraft orders amounted to 7,357 aircraft. That would represent upwards 9.2 years of backlog at the annual 2018 production volumes. This week, Airbus announced a new Executive Committee led by newly appointed CEO Guillaume Faury who assumed leadership this month. CEO Tom Enders had previously indicated that he would not seek a renewal of his management contract. Faury had taken over leadership of the Commercial Aircraft business in February 2018 after a prior five-year stint for overseeing Airbus’s Helicopter business unit. Included in the 12-member Executive Committee is Michael Schollhorn, Chief Operations Officer, Grazia Vittadini, Chief Technology Officer, and Christian Scherer, Chief Commercial Officer. As we note in our last quarterly operational update, various reports from German based web sites had indicated that a major fire that occurred at fuselage supplier Premium Aerotec at the very end of December could likely add to Airbus supply challenges. Given Q1’s delivery performance, it would appear that the potential supply disruption was managed during the quarter. Rival Boeing reported total Q1 customer deliveries of 149 aircraft, compared to 238 aircraft delivered in Q4-2018, which was an all-out effort to achieve its stated 2018 delivery milestone. In mid-March, Boeing was compelled to ground all of the existing global fleet of 737 MAX model aircraft after an Ethiopian Airlines aircraft crashed on takeoff. This was the second tragedy involving the 787 MAX after a Lion Air aircraft had plunged into the sea in October 2018. Preliminary respective air safety investigations are pointed to the aircraft’s flight control system as a probable cause for both tragedies. Last week, Boeing announced a temporary 20 percent reduction in the 737 monthly production schedule in lieu of the aircraft returning to operational status. A return to service and global-wide clearance is not expected for several more weeks, perhaps June of this year. In the meantime, Boeing’s Renton Washington manufacturing and logistics teams remained challenged in storing partially completed 737 MAX aircraft, with a need to eventually support installation of designated software and any needed required hardware fixes on both the existing global operational fleet and currently partially completed, parked aircraft. 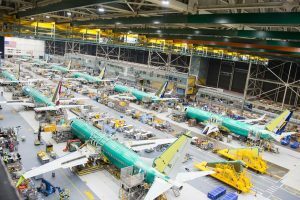 Boeing had previously indicated plans to boost single-aisle 737 production levels from 47 per month to 52 per month during 2018 but pushed that goal to 2019. That milestone is now subject to additional change given the current monthly cutback, and the timing of the MAX version being returned to operating flight status. If there is a silver lining for Boeing, it may be that critical supplies of aircraft engines and other components in shortage with have an opportunity to catch-up with existing and future volume production cadence needs. Boeing reported a total of 91 net new orders of aircraft in Q1, below prior quarterly order levels. Of that total, 29 aircraft orders, or 33 percent, were in the 737 single-aisle category, with the balance spread among wide-body aircraft models. Total customer order backlog for Boeing at the end of Q1 was reported as 5815 aircraft. That again represents slightly in excess of 7 years of backlog at 2018 annual production volumes. The challenges for Airbus and Boeing and their respective supply networks have been in constant change. In 2018, Airbus was challenged with engine performance issues related to its single aisle, A320 neo aircraft, its most popular model among airline customers. At the conclusion of Q1, Boeing is now challenged by one of its most corporate crisis in years involving its most popular and in-demand single aisle aircraft. How Boeing directs resources and responds to its ongoing crisis in the next several months will be critical. There will also be added costs related to program fixes, litigation, and compensation to respective airlines for lost revenues. Boeing was also moving in the direction of developing an entirely new mid-range aircraft as a replacement for the very popular but aged 757 aircraft fleet. That program make take on added significance if global airlines and respective flyers lose confidence in the MAX as a safe aircraft. Some airline customers may well elect to cancel some outstanding orders for the 737 MAX but turning to Airbus as an alternative comes with its own multi-year backlog challenges. That leaves the door open for other global aircraft manufacturers.